As a wife and mother of three young boys I do not have the freedom to paint whenever I would like. Most days it is a coordinated effort between chores, school runs, and other activities and obligations. In order to be prepared at a moment’s notice I have a full assortment of art of supplies on-hand in my, yes, I’ll say it, mini-van. Extra clothes and shoes for the kids, various snacks, plenty of juice boxes, bike helmets, two Razor scooters, a stroller, bug spray, and of course my camera all line our moving art studio. While the fall weather remains enjoyable, the kids and I are always ready for an outdoor excursion. I found myself presented with an opportunity to paint earlier in the week as my youngest was fast asleep in his car seat long before his usual morning nap. 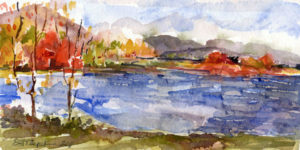 With my other two boys at school, I drove to Cheshire Lake along the Ashuwillticook Rail Trail to paint en plein air. Using the back of the mini-van, I laid out my materials to capture the 8:30 morning light on the lake. The grey looming cloud cover expected for the day had not fully presented itself. I observed boaters battling rough choppy waves created from the brisk breezy fall air that swept across the water. Two fishermen tried their hand at a morning catch while I painted and drank my coffee. I worked quickly with loose strokes and knife work to complete a 6×12 scene; all the while my youngest was fast asleep. With one composition down, I opted to move to the opposite calmer side of the park to capture an old warehouse quietly reflecting on the water’s edge. I parked at the end of the boat ramp and was part way through my setup when my son awoke. We continued our mother-son pseudo tailgate party as he sat in his stroller eating his snack of sliced strawberries, dry cereal, and orange juice. I painted a bit longer as he threw bits of snack to the birds overhead. As the morning lingered, more people arrived to take in the park. A couple out bird watching spotted a hawk and were taking pictures. A group of ladies gathered for a fast-paced walk while several men readied their biking gear for the trail. Also out was a friendly couple from New Jersey with whom I struck up a conversation. Up for the beauty of the fall foliage, Nessa Neilson Morse was also a watercolor artist. She too was racing the morning light and grey looming skies to capture reference scenes with her camera to paint at a later date. Swapping our artistic experiences, website information, and love for the scenes of the Ashuwillticook Rail Trail, Nessa commented how great mini-vans were for painting on the go. As my son finished the remains of his sippy cup, he let out several screams indicating “I want to go now.” My second composition incomplete, I knew for now my morning painting en plein air was over. Still planning to take in some foliage throughout the Berkshires or your own trek on the Ashuwillticook Rail Trail this season? Stop by the Adams Free Library, 92 Park Street, to see my exhibit of original watercolors on display through November. For library hours call (413) 743-8345. For a limited time, I am offering free shipping from my Etsy Shop, where you can find many of my new autumnal pieces. Enjoy the beauty of the season and get a head-start on your holiday shopping! Coupon code [FALL2011FS]. Offer expires November 5, 2011, domestic shipping only.